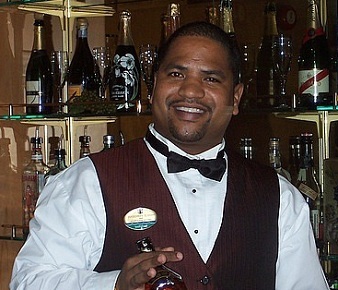 Cruise Ship Jobs - Bartender. Bartender jobs on cruise ships. Cruise line bartender vacancies, requirements and salary range. - Reports to the Head Bartender and Assistant Bar Manager and directly supervises supports and evaluates the performance of subordinate beverage operations positions - Assistant Bartender, Beverage/ Bar Server/ Bar Waiter/ Waitress, Assistant Bartender, Bar Utility Staff. - Responsible for providing professional and courteous service to passengers in all bars and beverage outlets throughout the cruise ship as well as serving staff and crew members in the crew bar. - Ensures that smooth operation of bars is maintained at all times and the quality of services provided meet the standards of the cruise line. - Assists the Head Bartender in the on-the-job day-to-day training of subordinate Bar Staff covering all aspects of beverage service and makes sure that they perform up to the standards of service set by the cruise line. - Responsible for achieving and exceeding the revenue targets through applying various sales techniques, up-selling, suggestive selling and in the same time keeping the cost levels within the limits set by the Bar Manager/ Beverage Director. - Ensures that drinks are properly garnished and served in the appropriate glassware, the bar counter is set with napkins, straws, menus, matches and ashtrays, as well as ensures that all orders placed by Bar Servers/ Waiters/ Waitresses are properly filled. - Responsible for keeping the bar area clean and sanitized according to current USPH rules and regulations of the cruise line and also for beverage inventory control, re-supply, loading provisions from the ship's storage rooms. Minimum two to three years of beverage serving experience in a hotel, bar, resort, or an equivalent combination of experience and education. Cruise ship experience is preferred. Candidates must be able quickly to calculate discounts, interest, commissions, tips, proportions and percentages. $2200-3600 U.S. per month depending on the cruise line, size of ship and gratuities from passengers. Possibilities for promotion to Head Bartender position.